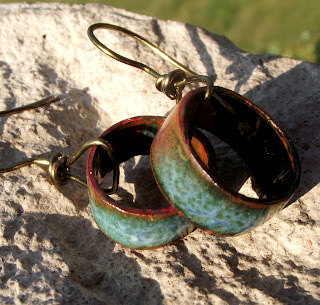 I entered a give-away on Love My Art Jewelry - and I won the most wonderful copper tube earrings made by MaryAnn Carroll. These earrings really rock. I could not at first remember what they looked like, but I thought "They could not possibly be the simple ones I remember from a week or so ago." But they were. I'm in love! You can see more of MaryAnn's earrings here Artisan Beads Plus but I think mine are the best.